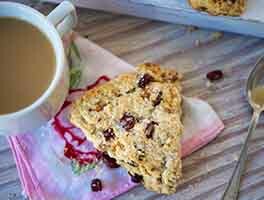 These tender scones have just the right amount of maple; it's their primary flavor, but not so pronounced that it over-takes the mild millet flavor, or that the scones end up cloyingly sweet. 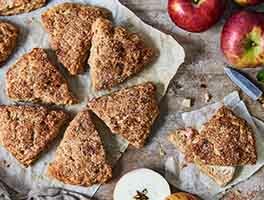 You can choose to skip the glaze, if you're a scone purist, but we particularly love the contrast between sweet, maple-y glaze and delicate, crunchy, whole grain scones. Place a rack in the top third of the oven and preheat the oven to 450°F. Lightly grease a baking sheet, or line it with parchment. 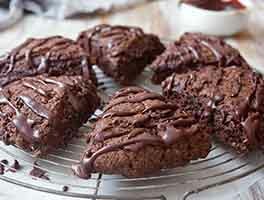 To make the scones: In a large mixing bowl, blend together the flours, six-grain blend, baking powder, and salt until thoroughly combined. Work the butter into the dry ingredients until the mixture is unevenly crumbly. Combine the maple syrup, egg, and milk, then stir the liquid ingredients into the dry mixture just until the dough becomes cohesive; it will be slightly sticky at this stage. Allow the dough to rest for 5 to 10 minutes to give the millet time to absorb some of the liquid. Turn the dough out onto a lightly floured surface, and knead it very gently about 10 times, just enough to bring it together. Press the dough into an 8" circle, and cut the circle into 8 wedge-shaped pieces with a knife or bench knife. Transfer each scone gently to the prepared baking sheet, leaving a half inch or so between them. 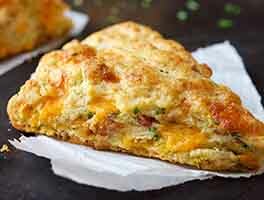 Freeze the scones for 20 to 30 minutes; this will give them a higher rise in the oven. Bake the scones for about 13 to 15 minutes, until they're a light golden brown. Remove the scones from the oven, and transfer them to a rack to cool slightly. To make the glaze: Stir together the sugar and syrup until evenly combined. Add enough milk to make the glaze pourable. 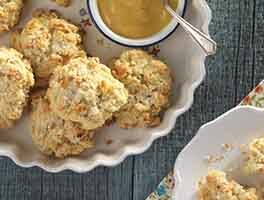 Drizzle or spoon the glaze over the warm scones, and allow it to set before serving. Wrap any leftover scones in an airtight container, and store several days at room temperature; freeze unglazed scones for longer storage. Trying millet flour for the first time. I liked these. Real maple syrup adds real flavor to the scone and glaze. I will make them again. neat way to get to taste a new (to me) flour. a little bit denser than im used to for a scone but worth having the dominant flavor profile mixed up a bit (we eat a lot of scones). added a half pint of blueberries. yummy! looking forward to more millet recipes KAF!